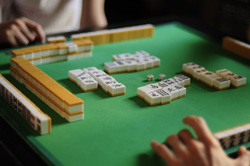 We are a new Mahjong club based in Andover, Hampshire UK who meet regularly. We are particularly welcoming new players as we are a new club that is striving to make Mahjong as accessible as possible! We follow classical chinese, and Japanese 'Riichi' mahjong. Mahjong is fun, exciting and a perfect way to meet friends!